Corner Rocket: The KTM 390 DUKE is a pure example of what draws so many to the thrill of street motorcycling. This Corner Rocket maximizes enjoyment and user value, taking the honors wherever nimble handling counts. Light as a feather, powerful and packed with state-of-the-art technology, it guarantees a thrilling ride, whether you're fighting your way through the urban jungle or carving your name into a forest of bends. The KTM 390 DUKE finds itself more at home the steeper you lean it. Its state-of-the-art, single-cylinder engine with twin overhead camshafts is perfectly tuned to conquer every turn you take on - with the torque to hold the line, and the snappy response to blast out from the apex and into the next bend. Premium Power: The KTM 390 DUKE engine not only delivers arm-wrenching torque and hair-raising acceleration, but also good manners in everyday use, all with outstanding fuel economy. This lightweight, compact engine really packs a punch and with 32 kW (44 hp) it's one of the most powerful options out there for A2 riders. Thanks to the ingenious intake design and the meticulous fuel injection system, the KTM 390 DUKE is ready and waiting to tear-up the streets and the circuits alike. It's the guarantee of a smooth throttle response, more than simply the absence of a throttle cable. The KTM 390 DUKE's ride by wire ensures perfect delivery of the readily available and gut-wrenching torque. It also electronically translates the throttle commands of the rider into throttle valve positions, perfectly suited to the riding conditions, making this the perfect crossover bike for both road and circuit riding. 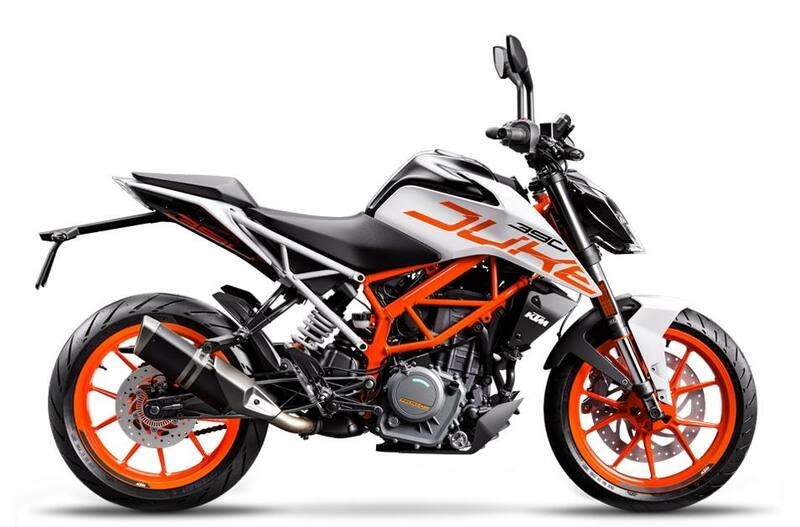 Just like the 1290 SUPER DUKE R, the four valves in the cylinder head of the KTM 390 DUKE are actuated by two overhead camshafts and ultra-hard, carbon coated cam followers. The result is an ultra-reliable, long-lasting engine that produces next-level power. Make it sing: The KTM 390 DUKE's lightweight and precision-crafted exhaust system comprises of a side exhaust, link pipe and silencer. The three-chamber silencer has been positioned close to the bike's overall center of gravity, improving balance and handling, whilst also delivering smooth, instant and beast-like power. Oh, and it looks angry as hell too. The KTM 390 DUKE's state-of-the-art chassis, with its lightweight steel trellis frame, makes this bike a real master in the bends. With mass grouped close to the center of gravity, it has maximum maneuverability and precision - ready to win the rush-hour slalom day in, day out. Ultra-light: As light as they are stable, the 17-inch cast alloy racing wheels help you put the power down with confidence, utilizing a 110 mm wide wheel at the front and an impressive 150 mm at the rear. 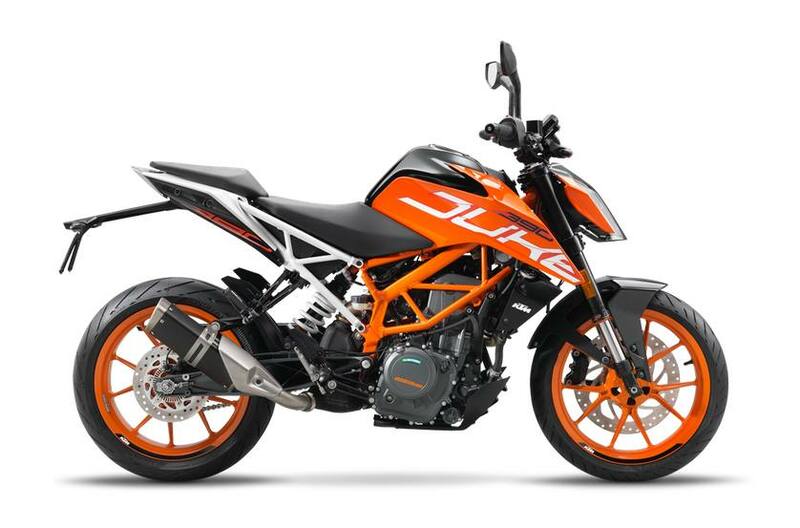 Wrapped in premium rubber, the pro-spec tires will keep your KTM 390 DUKE glued to the road. They offer outstanding grip in both wet and dry conditions, as well as providing supreme durability, even for riders that know how to push tires to their absolute limits. 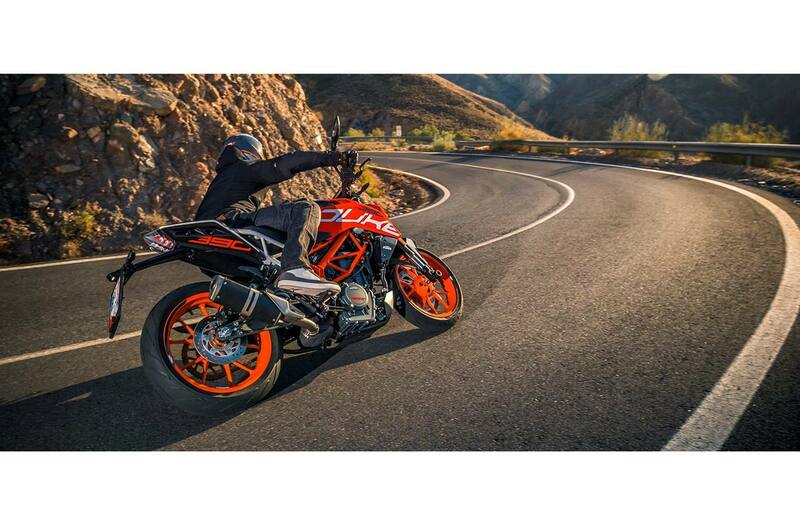 Thanks to its progressive 150 mm spring, the KTM 390 DUKE will perform in any environment you can throw at it. The preload is adjustable, so you can count on well-balanced suspension whether you're riding solo or two-up, with or without luggage, on road or on track. The choice is yours. Perfect knee contact: The innovative and ergonomic 13.4 liter steel fuel tank not only provides riders with perfect knee contact for attacking every corner, but also with an unbelievably long range, even when you ride as fast as you dare all day long. Seated for speed: The two-part seat offers first class sport riding ergonomics with perfect support for both rider and pillion. A seat height of 820 mm enables riders to have a super- secure position, whilst also being high enough for ultimate cornering fun. The Pillion seat has been integrated into the bodywork so as not to compromise the stunt-ready look of the KTM 390 DUKE, whilst also ensuring excellent comfort for the passenger. Ultimate control: Hi-tech upright handlebars offer KTM 390 DUKE riders a controlled yet aggressive body position, allowing you to dominate in all aspects of riding. From destroying corners to pulling the perfect stoppie, these bars will give you the balance and confidence you need to attack the tarmac like never before. Clutch and brake levers are fully adjustable, allowing you to customize your cockpit to suit your individual riding style. The clutch and brake lever are adjustable in order to match the needs of any rider's hand type. Multicolor display: As an absolute first in its class, the KTM 390 DUKE boasts an innovative multicolor TFT display, presenting all the data you need to go faster in a clear-cut, uncluttered way. As you rev the engine, the display bars change color, either spurring you on or telling you to back off when the engine's still cold. The display also automatically adapts its color to best suit the light conditions around you. Innovation at its best!!! Different modes for the various built-in assistance systems can be selected using an illuminated menu switch on the left side of the handlebar. It's very simple and intuitive: flick "up" and "down" through the menu, select the desired setting with the right button or go a step back with the left. Job done. Race on. Mean illumination: The aggressively styled LED headlight on the KTM 390 DUKE is a big highlight in this bike's design and a clear referral to its big brother, the KTM 1290 SUPER DUKE R. Practical as well as looking ultra-mean, it produces outstanding visibility for riding in low light or dark conditions. The parking light, which consists of 20 LEDs, ensures that the bike is highly visible to other road users, keeping you safe while you dominate the streets. Dual circuit BOSCH ABS is standard equipment on the KTM 390 DUKE. Use it to your advantage to enhance control and safety. Thrill-seeking riders will love the added fun-factor (and extra racetrack control) of the advanced ‘Supermoto Mode', activated at the push of a button. When engaged, the system will only control the front brake. Rear brake pressure is entirely up to the rider's right foot, allowing you to push your riding skills to the absolute limit. The KTM 390 DUKE gives you the handy option to tether your smartphone directly to your bike via the advanced KTM MY RIDE. This easy-to-use upgrade system gives you full control over incoming calls and features a pumping audio player for your favorite riding tunes. All the information pops up on the bike´s display, letting you manage everything from the menu switch, while you keep your hands where they belong - firmly on the bars.